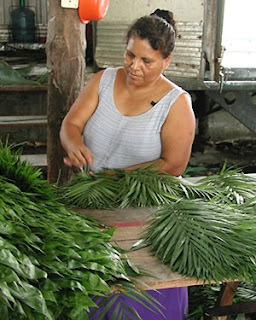 As more Christian churches are getting on board with a more earth-friendly theology and practise, a movement has started to ensure that the palm fronds used on Palm Sunday for the reenactment of Jesus' entrance into Jerusalem will be fair-trade palm fronds. About 640,000 palm fronds will be distributed this Sunday in some 2,500 congregations as part of the this eco-palm program. So far this project has grown into a $4.5 million business.